Punica granatum, more commonly known as the pomegranate, is a small deciduous tree found in warm climates throughout the world. It generally grows to be about five meters in height, but may grow up to twice that size. It has elongated leaves arranged in an alternating pattern along thorny branches. These leaves have a polished appearance and are quite durable. Bright orange, red, or white flowers may be clustered or dispersed sporadically near the ends of the branches. Following pollination, fruit emerges from these flowers. The fruit ranges in color from deep red to pale yellow, depending on the variety of the tree. Ripe pomegranate fruit may be up to five inches in diameter. It contains a hard outer casing that is mostly round with a crown, known as a calyx, on one end. Inside are hundreds of tiny arils, each similar in size to a kernel of corn, that are sectioned into chambers by white membranous material called pericarp. While the pericarp is bitter and inedible, the prized arils are not. Depending on the variety, the arils may be sweet or somewhat tart. Each aril contains one seed and is plump with brightly colored pulp. The pomegranate is an important species due to interactions with all sorts of organisms. Humans have discovered numerous ways in which it can benefit health thanks to a wide range of medicinal properties. New medicinal uses are still being researched today. The pomegranate holds endless possibilities for medical hope. 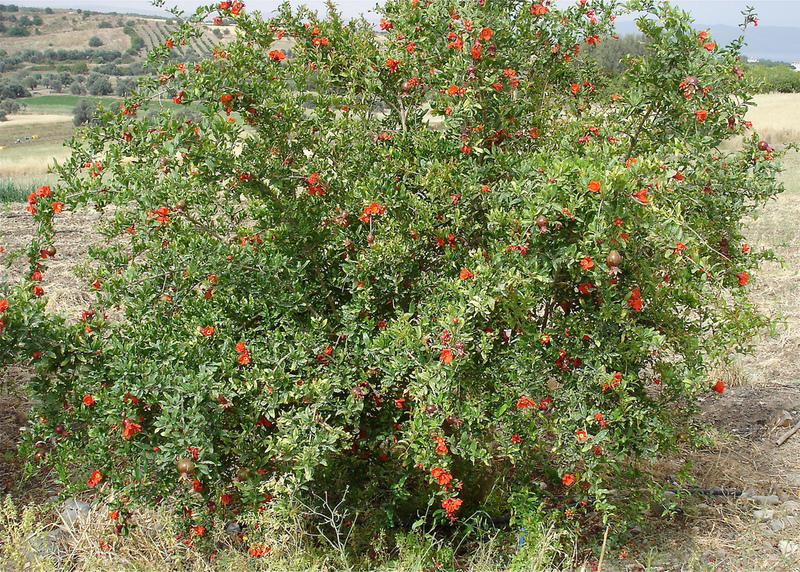 To learn about the relations between Punica granatum and other species, visit CLASSIFICATION. If confused by the terminology on this site, don't hesitate to visit the GLOSSARY! Interested in learning about all sorts of organisms? Visit MultipleOrganisms.net to explore! This site was created by Sarah Kruse.